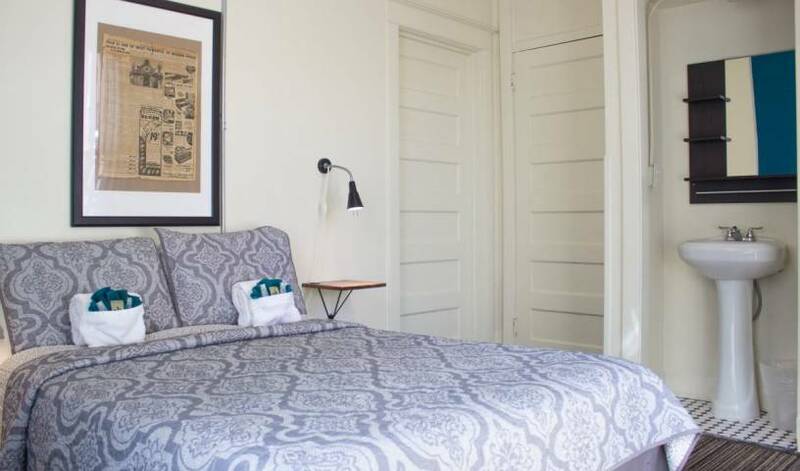 Explore Denver affordably with a rented twin bed. This room is shared with up to four other persons, each renting their own bunk. Guests will also have a locker for stowing valuables and luggage, access to the community kitchenette and lounge, and free wifi. Bathroom facilities are shared. Explore Denver affordably with a rented twin bed. This room is shared with up to six other persons, each renting their own bunk. Guests will also have a locker for stowing valuables, access to the community kitchenette and lounge, and free wifi. Bathroom facilities are shared. A traditional hotel room with private bathroom. This room sleeps up to two persons in a full-sized bed and includes access to the community lounge, kitchenette, and free wifi. A private room with private bathroom for up to four persons. This room includes two full-sized beds. Access to the community lounge and kitchenette and free wifi is included.